Yesterday, the songs I made from Dave Moore’s cycle of poems about Vampira had taken us up to her short run as the first “horror host” in the early days of television. As recounted in that post, by the time her little more than a year of broadcasting fame had wrapped up, the idea of a sardonic costumed character hosting late night showings of horror and SciFi films went nationwide, with dozens of local reflections of that concept. None of them were exactly like Vampira though, and oddly, all of them were male. 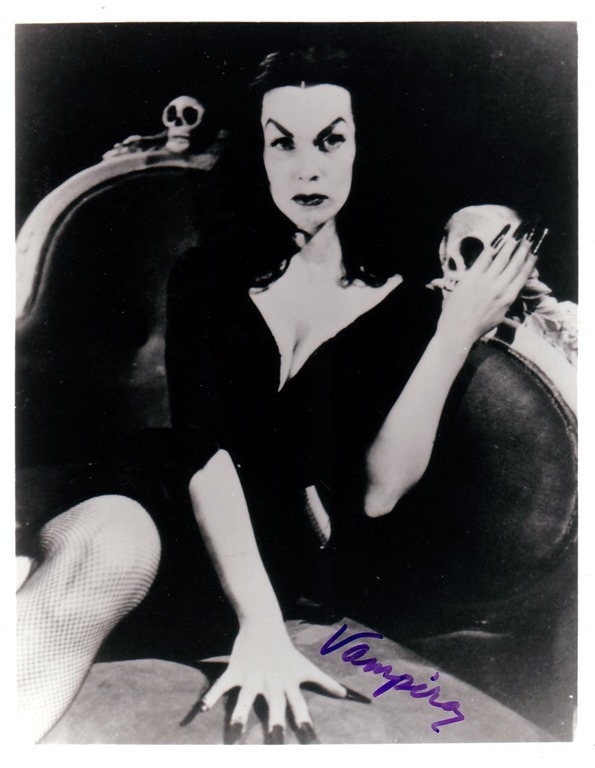 Vampira’s creator, Finish-American Maila Nurmi kept at a show business career following her TV host stint, including some Los Vegas work with Liberace, but as the 1950s started to conclude, she was getting farther and farther from the brass ring. Should there be any wonder that this would have been so? No, there were few models of self-defined female performers in the Fifties, and it was her character, Vampira, not herself, that held what fame remained. And that character, combining as it did fears of death with fears of female sexuality, both attracted and repelled where it was remembered. It was in this context that Nurmi took a role in a micro-budgeted movie with an incoherent script and famously eccentric director: “Plan 9 From Outer Space.” When the movie was completed, if such a disaster could say to have completion, it hung around in obscurity even lower than Nurmi’s for more than a decade. 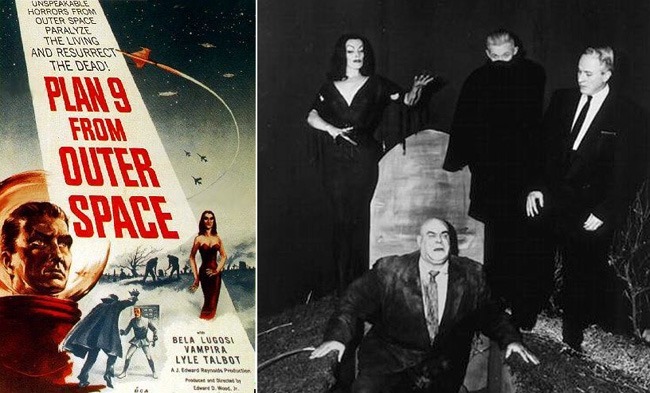 Like 80s video game packages, Plan 9’s poster has higher production values than the movie. Nurmi pressed on with living, less and less known. There were a couple more bit parts, and her day gig sometimes was “handyman” work in the homes of the more affluent. Poet Kevin Fitzpatrick remarked after reading Dave Moore’s pieces on Nurmi’s resilience that she was showing “Sisu,” that untranslatable Finnish characteristic that says that determination will get you through any challenge. And then something odd happened. The same generation of film scholars and fans that helped recognize the value in genre fare like pre-war horror movies, low-budget serials, or the foreign oddness of Japanese monster movies began to look around all the blind corners of obscure film. What made a film that met few of the criteria of good cinema still interesting? Could it be that watching a film fail to fulfill it’s duties had a fascination in itself? What would the worst possible movie be like? In 1978 a couple of movie critics put together a book called “The Fifty Worst Films Of All Time.” Like many lists of superlatives, it generated plenty of response, but one response was to claim that they’d overlooked this now 20 year old film that was seen mostly on TV, late at night, when viewers just couldn’t believe the bad dream they were seeing. The authors, Michael and Harry Medved, figured there was another, better book about worser movies, and in 1980 they redid their lowerarchy with a follow up book that named “Plan 9 from Outer Space” the worst movie of all time, and it’s director, Ed Wood, the worst director of all time. And since then, nothing has challenged that assessment, it’s become the “Citizen Kane” of bad cinema, a movie seen by millions who are astounded by its, ah, quality. Maila Nurmi arrives in L.A., and as she considers what persona to take on she considers celebrity evangelist Amiee Semple. in the midst of the supposedly peaceful and satisfied Fifties? The last part of the tale, how “Plan 9” allowed Vampira to be seen by a new generation. Let’s leave off those modernists of the era around WWI for a while, and move to a few songs about some midcentury mods. This is the time when popular culture mutated into something recognizable as ours, as it still is into this 21st Century. Somewhere in this second decade of the 21st Century a new modernism is likely being born, but I do not know it yet. Back in the early 1950s people expected something new, perhaps as much or more than we expect change today in 2017. As it turns out, we may have not gotten all the change we thought we were due. Somewhere in the later 1960s it became a commonplace to view the 1950s as an era of calm, peace, satisfaction and complacency, and this characterization has only increased over time. But this was also the era just after a cataclysmic war ended with atom bombs, a horror that eventually moved from reality, to nightmares, to repressed acceptance, to forgetfulness and finally now again to present fears. This was the decade of a forgotten, brutal, war in Korea. This was an era when society tried to put back into the bottle the broadening social roles for women and Afro-Americans that WWII had allowed. This was the time that revealed the horrible efficiency of the extermination and slave labor camps, and the decade in which the utopian dream of Communism exposed its shames and shams. This was a deeply uneasy time when some feared everything “normal” was a dream and others saw clearly the waking hours outside the dream. All of which makes this campy TV quipster host who created the makeup, costume and persona of Vampira seem inadequate to address this. Well, what is? As we move to celebrate Halloween, that strangest of holidays, where we make fun of our inability to escape fear, death, and too much candy, let’s reconsider her. “Helen Heaven” has words written by Dave Moore, the alternate voice and writer/musician here at the Parlando Project, along with music written and performed by myself. 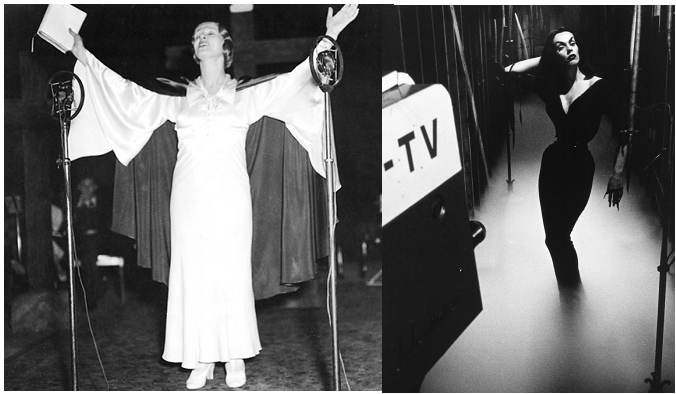 This piece is the first song in the Vampira song-cycle, contrasting the LA-based white-dressed pop-religious phenomenon Aimee Semple McPherson with Nurmi/Vampira’s dark negative. To hear “Helen Heaven” use the player you should see just below this.